So precious, this set of 6 tea cups in an intricate cut glass pattern. I was delighted to find so many together and in perfect condition. Ice cream for everyone! This sweet set of fruit compote or ice cream bowls on a footed pedestal are a treat! In a traditional grapevine pattern. 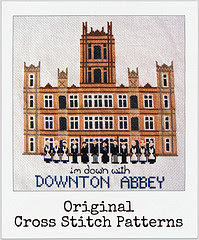 The piece de la resistance! I'll probably regret selling this amazing vase decorated with swans and cattails...I've really never seen a lovelier piece of milk glass! Memorial Day ushers in a warm welcome to Summer and hopefully the beginning of a three day weekend for most! With a nice chunk of time (if you're not headed to a beach) why not make the most of it and tackle a paint project or two? 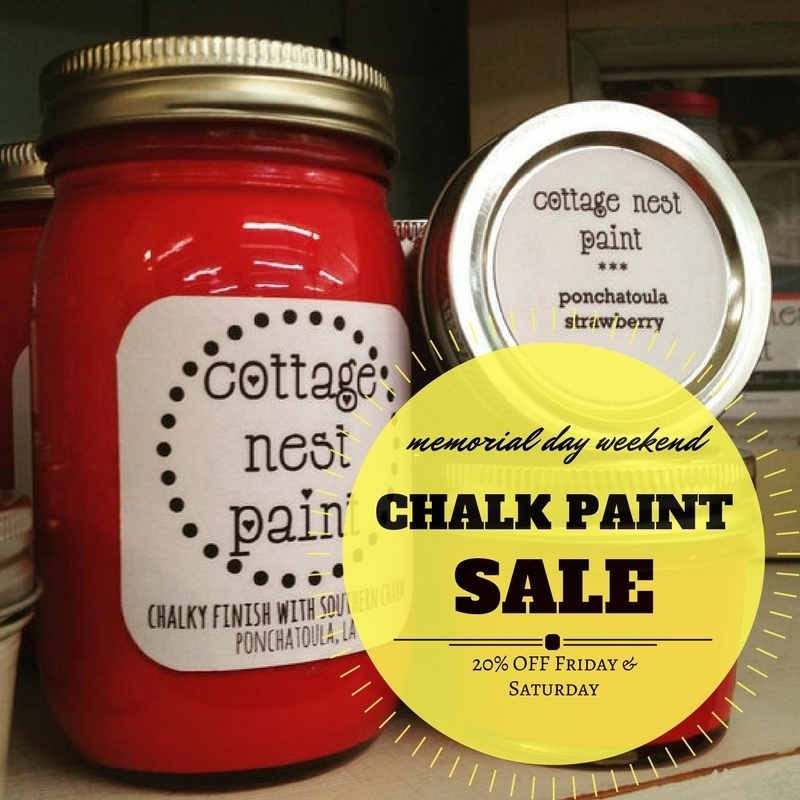 Not only is the extended weekend perfect but we've marked down all Cottage Nest Paint 20% OFF Friday and Saturday only! Stock up on our basics like either of our whites, Cotton or Sweet Olive and check out our newest colors, Oyster and Pothole. And need a little inspiration? Check out this video I pulled together of a piece I refinished with Zach of Rekindled Designs. Have a wonderful Memorial Day Weekend and thanks to all our military & their families who sacrifice daily for our freedom. Walkthru Wednesday: Mother's Day Challenge! I also want to add, particularly when giving to someone you may feel never likes what you give them (that's tough! ); take the expectation out of gift giving. I know we all want to wow the other person, but when we give, it is one of our greatest acts to let go for the betterment of another. An additional tip I recommended in selecting a gift, especially for someone you may not know that well (say a future mother in law), give something that says something about yourself. A candle that reminds you of a pie your grandmother made for you as a child, a vase with flowers because you remember your father giving something similar to your mother, or even your favorite novel. A gift with a story grows wings, becomes less of just another thing but rather an experience, memory you now both share. Most nights, including last night, after I get home from the shop, spend time with my kids, put them to bed, I get back to working on my store. Last night it was both developing products and strategies for the next few months. Though I'm running myself ragged, it's quiet and I can finally think...and somewhere in my research last night this lovely nugget pops up to remind me why I started this journey. If I've never told you this, I was in my twenties in college pursuing a degree in Interior Design. And as together as that sounds for a young person, I was completely ambivalent about this path. I was in a place in my life that I was pressured to "pick something already!" I should of been listening to my gut, because I actually did know what I wanted to do. Every couple months I found myself on Magazine St. in New Orleans, walking from independent shop to independent shop. Meeting retailers, each with their own story...dream. I particularly loved shops that offered items that, I as a poor college kid, could afford; not everything in the store was low priced but I could at least walk away with a treasure. I told my mother half way thru my degree that I wanted to open my own store and sell items that anyone could find at least one thing they could afford and treasure. I should preface this and say my mother is completely supportive of my business now, but in that moment, she said "absolutely not." So, I did become an interior designer, for a better part of 10 years I worked in commercial design with nationwide clients and million dollar budgets. Of course no one will tell you in school, that there will be nights you'll stay up trying to find the best toilet seat and light bulbs for a facility that services the mentally ill and could use the wrong design to commit suicide. I respect someone has to make these decisions, but I knew I had to find my own path soon...as this job was literally killing me. One morning, on my drive into work, I called my spouse, I was literally in tears, and it just flowed out of me...the entire concept for this store and it's name just came out of my mouth. 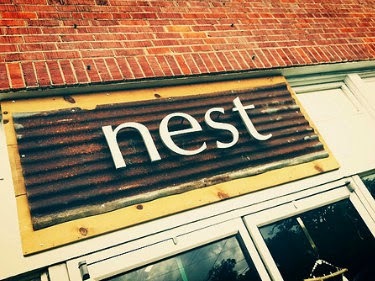 It's funny how when you say something you actually become accountable for it - in about 3 months we bought the building we're in now, and about 18 months later we opened Nest. Fast forward about 10 years, I probably work harder than I did as that interior designer ping ponging from deadline to deadline, but it's the most rewarding thing I've done. And yes, just as I wanted to do as a twenty-something, I curate a shop that anyone at any budget can find something. It has literally made my day for a child to bring me a jar of change they saved because they can buy something from my shop. I've helped people put back the normal in their lives after the area flooded twice last year with our furnishings and accessories. And just this week, a customer called for anything with a cardinal. Knee deep, in my stock room unboxing Christmas because that's the only place I'll have one, I find a cardinal garden stake, today it's at a relatives funeral. These are more than things we sell, these are the treasures and proof of our lives together and love we hold for one another. Sometimes I do forget this, at night, when my feet hurt from standing all day, upset from someone I couldn't please, burned out, but someone like yourselves will walk in the next day and tell me, "What a beautiful store" or "this is just what I needed" and I can't thank you enough for being part of my why.